Eighth-grader Wilma Sturtz is ignored and miserable at school. One day, she offers her seat on the bus to an old lady who offers to grant her one wish. Wilma asks to be popular, and her wish is fulfilled. At first, her life changes for the better--then Wilma realizes her wish has an expiration date. What can she do to remain loved by her new friends? 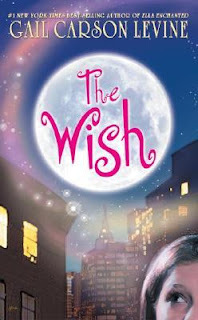 Gail Carson Levine is known for her fairy tale retellings, but THE WISH is a very realistic story with just a hint of magic. In contemporary New York, Wilma is a regular girl--intelligent, average-looking, and a little bit awkward. When she has the chance to become someone popular, well-known and liked, she takes it. All of a sudden, she has a secret admirer, many not-so-secret admirers, and classmates falling at her feet in hopes of impressing her. But this leads Wilma to question: What exactly do they like about her? How can she remain true to herself if she doesn't know who that self is? The Wish avoids the gossip girl/mean girl cliches by presenting even the "popular crowd" as real people with capacities to be kind. Although some characters are less likable than others, no "villain" overshadows Wilma's world. Instead, The Wish presents an array of believable kids, trying to navigate the tumultuous waters of middle school. Light humor and romance contribute to a fun and interesting story.